Summary: Sixteen-year-old Lex Bartleby has sucker-punched her last classmate. Fed up with her punkish, wild behavior, her parents ship her off to upstate New York to live with her Uncle Mort for the summer, hoping that a few months of dirty farm work will whip her back into shape. But Uncle Mort’s true occupation is much dirtier than that of shoveling manure. 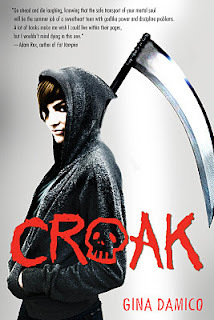 My Thoughts: When I started reading Croak, I wasn’t too sure about it. Sure, it has an interesting plot line (reminds me of Dead Like Me tv show) and it sounds like it could have a little bit of romance on top of the interesting plot line. To sum it up, Lex gets shipped off to her uncle’s house thinking it’s going to be a boring uneventful summer. Boy, is she wrong! Not what she was expecting at all. First, lets talk a little about the characters. First, there is Lex. Lex is going through a rebellious stage, always getting into trouble unlike her perfect sister. Lex is just going through a bit of a stage where she doesn’t really care about much anymore. Next, there is her uncle Mort. Mort kind of came off as creepy at first. I wasn’t sure what to think about him, but after a while he’s easy to warm up too. He has a bit of the same personality as Lex. Than there is Driggs. Driggs was such a fun character. Between his constant bickering with Lex, he sure is a riot to have around. He was probably my favorite out of the whole book. There are also a lot of other characters throughout the book including all of the other Junior Grim Reapers. Each one has his/her own story and contributes to the novel in some way. Croak was a different kind of story for me. It was such an interesting concept, I knew I had to at least give it a try. I would have liked to see more romance between Driggs and Lex but I always knew deep down there was something special there, even if it wasn’t always on the outside. Overall: I really enjoyed Croak. I didn’t love it as much as a 5 cupcake book but it was definitely interesting and kept my interest. It was such a weird plot that it was hard to resist reading it. I’m sure a lot of people will put this on their 2012 TBR pile! It’s fun, snarky, and has some cool characters. Cover: I’ve seen a few different variations of this cover and I like each one the same. I love how she has the big knife looking thing behind her. Also love how her hood is up on her head. I really enjoyed the humor in this book-that helped it to stand out in the crowded YA field. Definitely one to recommend! This book sounds like something I would enjoy. Thanks for the review! This sounds interesting. I'm starting to get into books with grim reapers in it (Soul Screamers!) so I'm really curious about it. Thanks for the honest review, I'm glad you enjoyed it!